The yacht known as Project May during construction the past few years made her big splash in April. 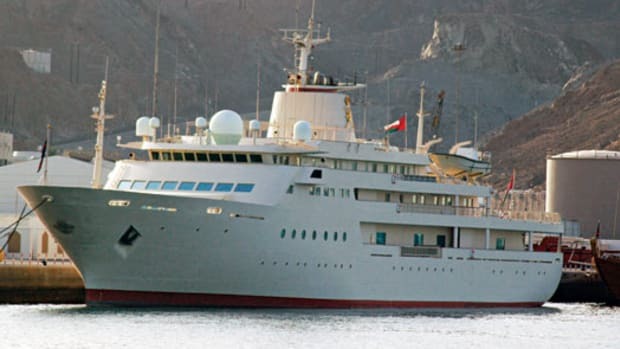 Sea trials (one of which we captured in our cover shot) were still occurring while we were going to press, so we expect her owner, the emir of Oman, will take delivery pretty soon. Details are scarce, though photos have revealed custom tenders (even with matching paint jobs) stowed high up on one of her decks. Eagle-eyed yacht-watchers will immediately note the styling similarities to other Tim Heywood designs, particularly Carinthia VII (though it could be the blue hull color that brings that particular yacht to mind the most). 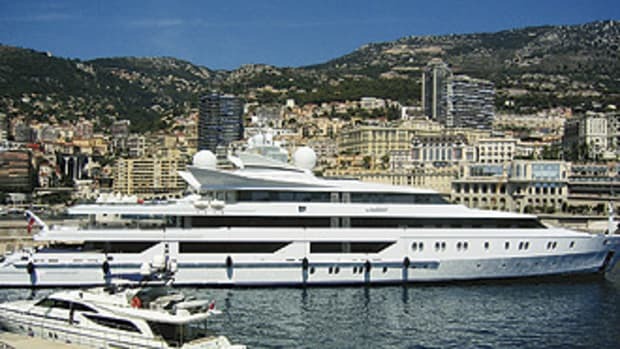 Al Mirqab replaced a same-named Oceanco measuring about 312 feet (which is now named Indian Empress, no. 15 in "The Power & Motoryacht 100" ).